K-Z Sportsmen Travel Trailers and Sportsmen Fifth Wheels are engineered and built to exceed your expectations. Backed by KZ’s 2-year warranty, KZ Manufacturing stands behind their Sportsmen RV’s. 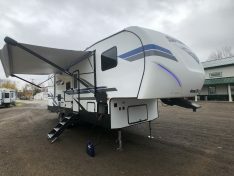 From The Equa-Flex suspension to the Superflex roof membrane with its own 12-year warranty, and everything in between, Sportsmen offers a floor plan that is right for you and your family. Super sized panoramic sliding windows surround the plush interiors. Built on sturdy 5/8″ tongue and groove plywood floor decking, the floor is covered with Congoleum linoleum which carries a 3-year cold crack warranty. Sportsmen RV’s….enjoyed by families for over 40 years and continuing to provide affordable quality.